Build was pretty straight forward. Installing the optical drive tray was a little tricky with the space to work with and depending on how big your screwdriver is. Was a little worried that the RAM might be too tall for the case, but there was enough clearance. If you were wondering why the screws on the heatsink were in an asymmetrical layout, I was missing 1 of the silver hex screws used to fasten down the heatsink so had to substitute one of the longer Philips screws. Just to note if you are planning on getting the 80W internal PSU, it uses 2mm hex screws so the supplied 2.5mm hex tool will not fit them. Had to go to the hardware store to pickup another hex tool for those. 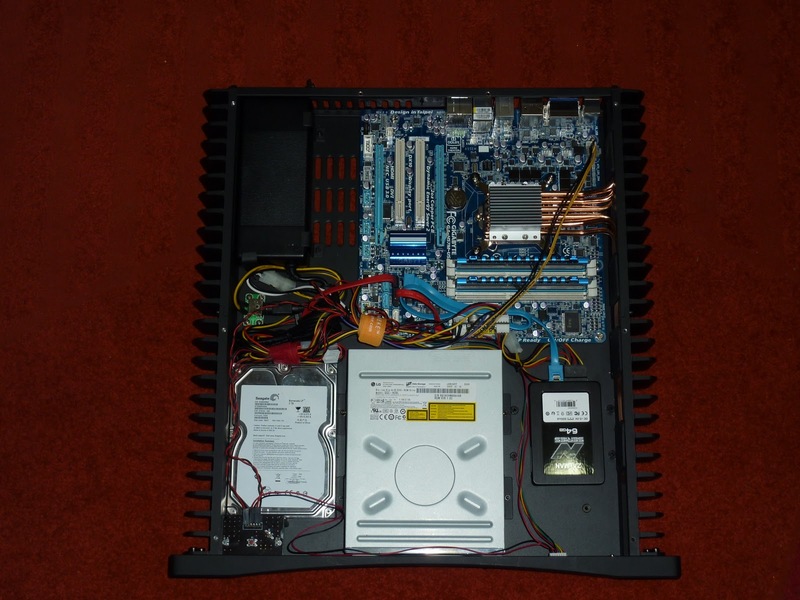 The ASRock motherboard has a CIR header, but the HDPLEX IR receiver was not compatible with it but worked fine plugged into a regular usb 2.0 header. Since I have a Logitech Harmony remote and use MCE keyboard commands in addition to the MCE remote ones as well, I had to disable all the buttons on the HDPLEX IR receiver so I could use my MCE IR receiver dongle. Essentially, I only use the HDPLEX IR receiver to power on from S5 which I was unable to with my dongle. Anyways, system is being run as a HTPC connected to my home theater. Running Windows 7 with WMC/MediaBrowser/madVR. Oh forgot to add to the original post, the slimline SATA cable from the PSU which connects the DVD drive to the motherboard was too short so I had to get a SATA extension cable. I have finish my build HDPLEX H3.SODD fanless computer case and thought I would post some pictures. This thing works perfect. I will be building another total silence love it plays anything I through at it. This was a fun build with a few challenges along the way. The build itself is working flawlessly. Getting all the software set up just right is taking longer, but that’s another story. As others have mentioned, Larry was helpful and quick to respond to all the questions I had before ordering. 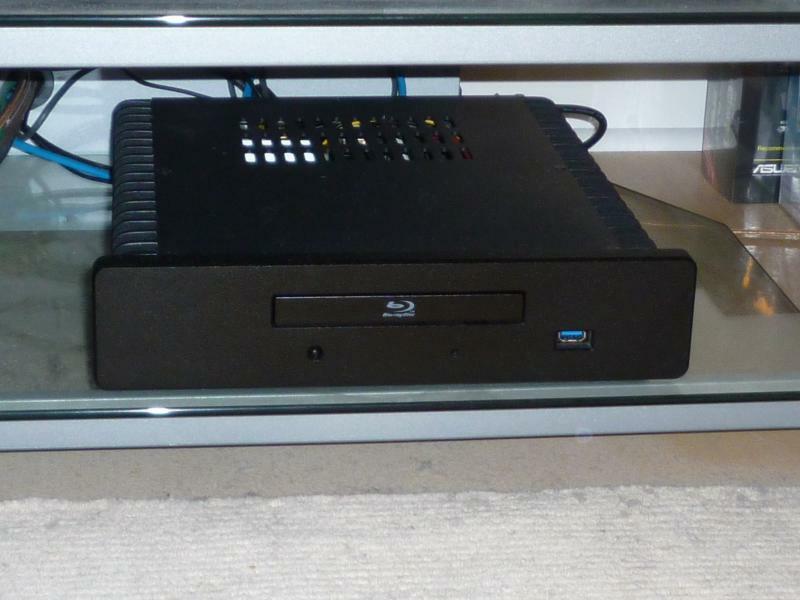 The HD-Plex H5.S case arrived well packaged and in good shape. There is a clear and well laid-out colour manual included which mirrors the guides on the website. The content is out of date, however, and at least with the parts I used, I had to think carefully about the best build order. 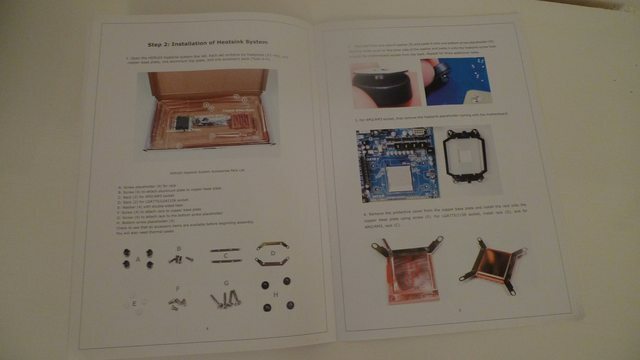 My biggest frustration with the manual was the section about the mountings that go on the back of the motherboard. These discs are too big and I had to carefully trim three of them to avoid overlapping components on the back of the board. They are attached with strong adhesive. 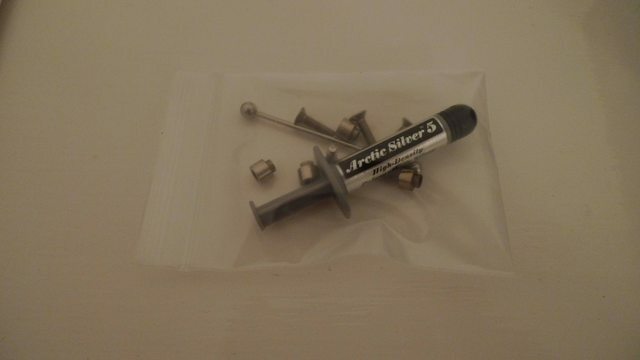 Much later in the build I found these fittings in the bag with the thermal paste. There was no reference to these fittings in the manual or the website. A quick email and Larry confirmed that they could be used instead of the big plastic discs for motherboards with clearance issues. ARGH! I had to backtrack right to the beginning of the build to swap out the big discs for the small ones. I wish this option had been made clear in the manual. The case itself is very nicely machined and the quality of the finish is excellent. 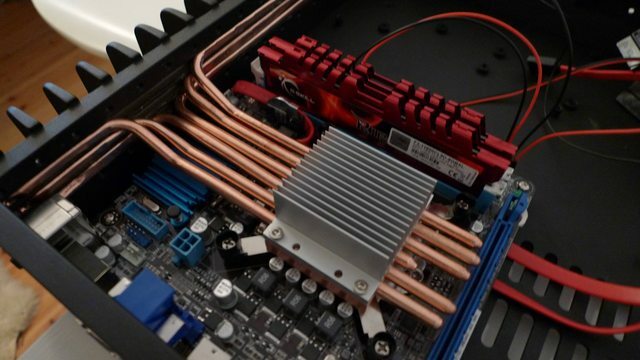 The grooves for the heatpipes are a good example, and one of the reasons why I chose this case over something like a Streacom case. 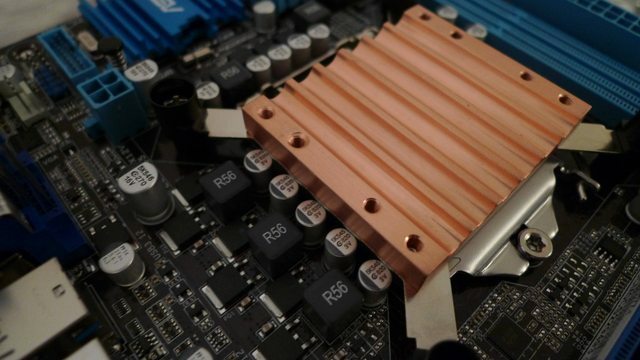 There were some oddities though, such as one heatpipe that was shorter than the rest. OK, I know that once the cover is on no one is ever going to see this, but it’s just one of those things that annoys me as there doesn’t seem to be a reason for it. 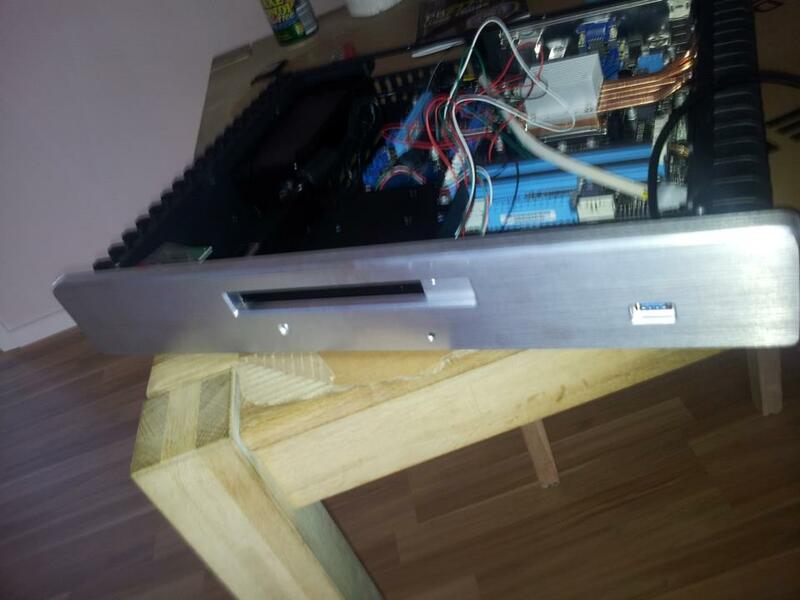 For my build I have an SSD for the OS and programs and an HDD for media in the case. I expect that eventually I will move my media to a NAS or similar, but for now the Caviar Green is as good as silent. 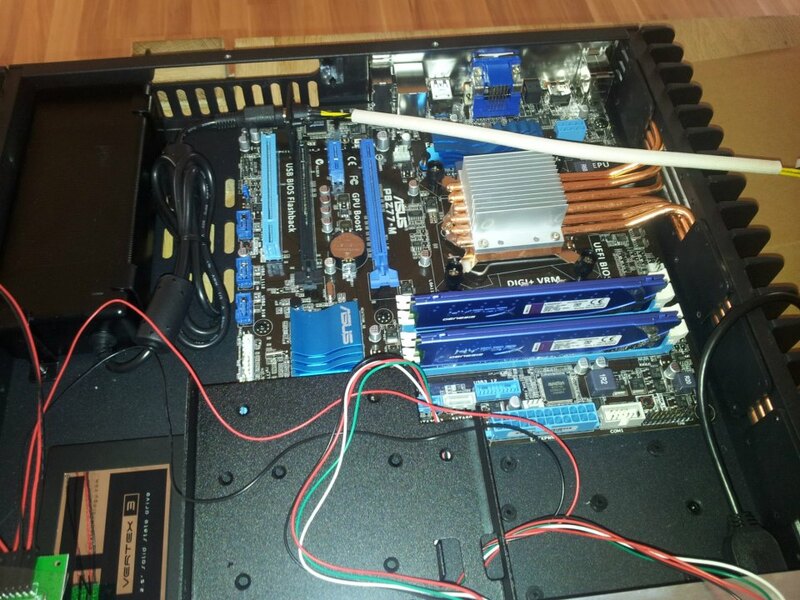 Having an HDD in the case limits the motherboard options considerably. 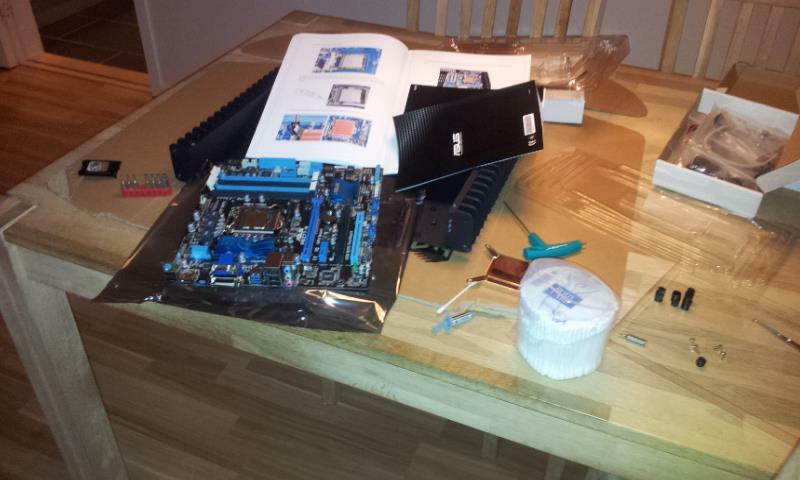 I wanted the internal power supply so that meant I had to use a mini-ITX motherboard. 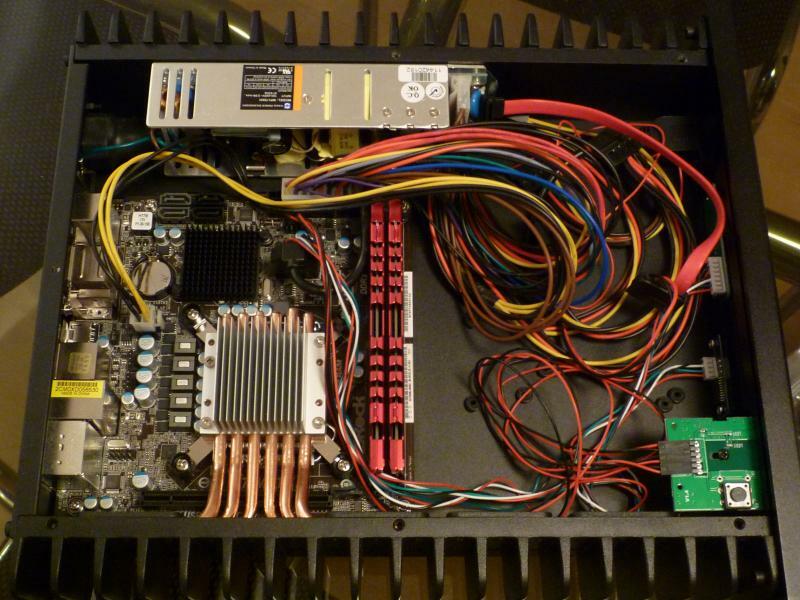 There are only five ITX boards that are compatible with H5.S and an Ivy Bridge processor. 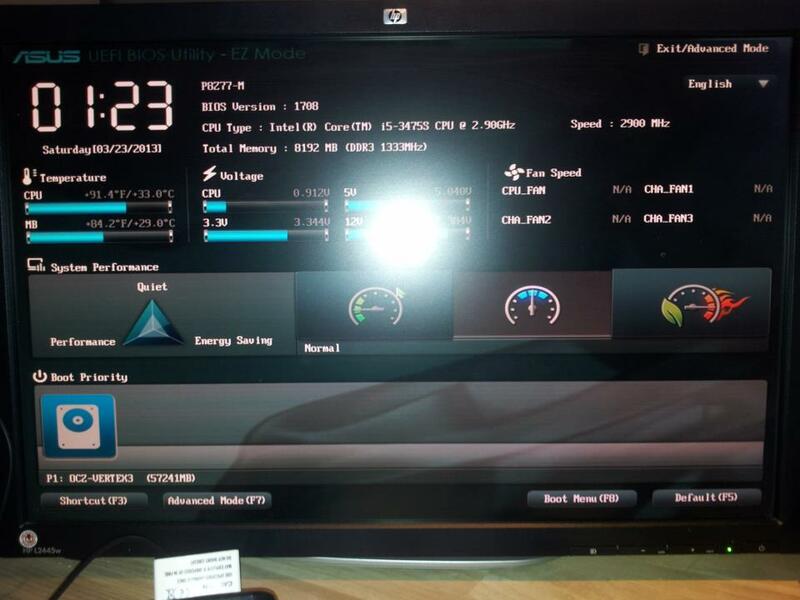 Of those, three are expensive Z77 models with unnecessary features. There is an H77 ZOTAC but it has unneeded Wi-Fi and is too expensive. I chose the ASUS P8H77-I as it was the cheapest but it is probably not the best choice for the H5.S. 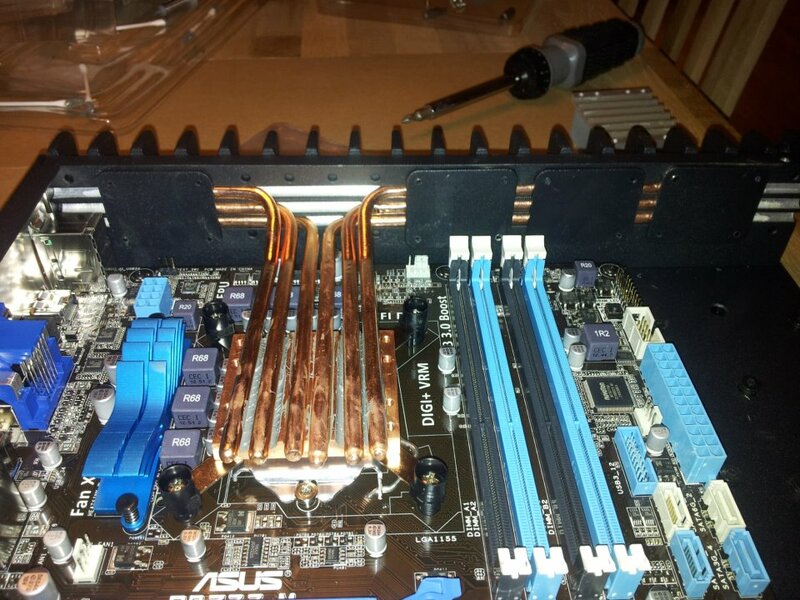 The heatsink is close enough to touch some of the motherboard components and I had to make sure it wasn’t pressing down on them when I tightened the screws. 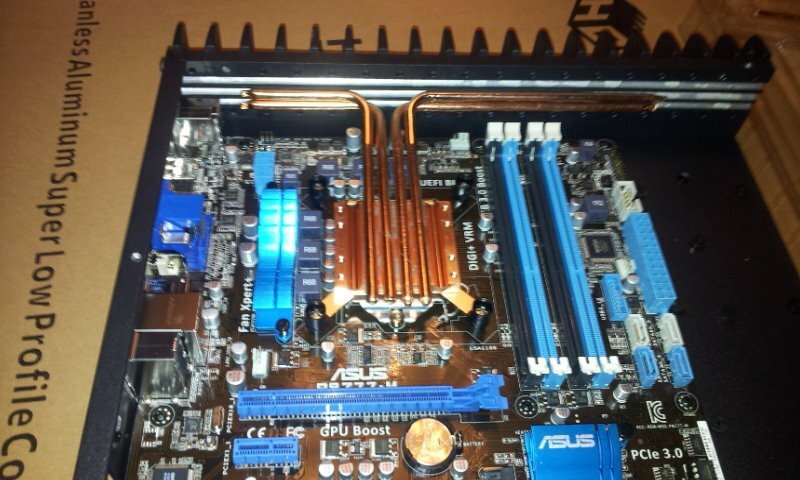 The biggest problem with the ASUS motherboard is the position of the SATA sockets. 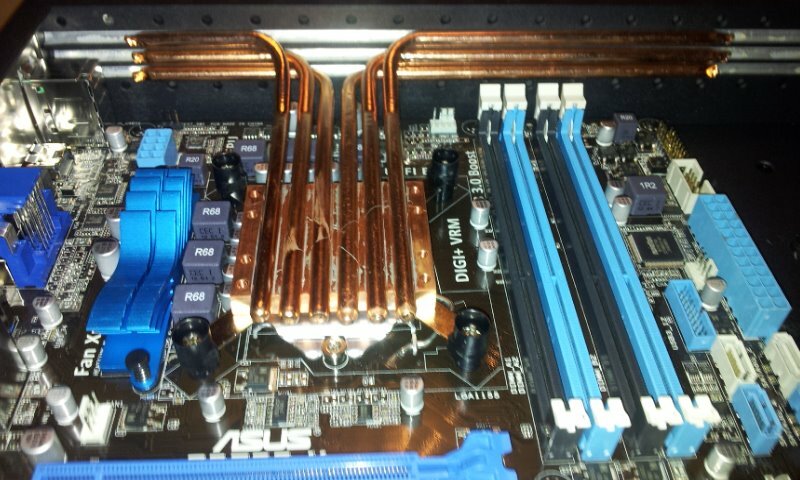 They are right underneath the heatpipes. 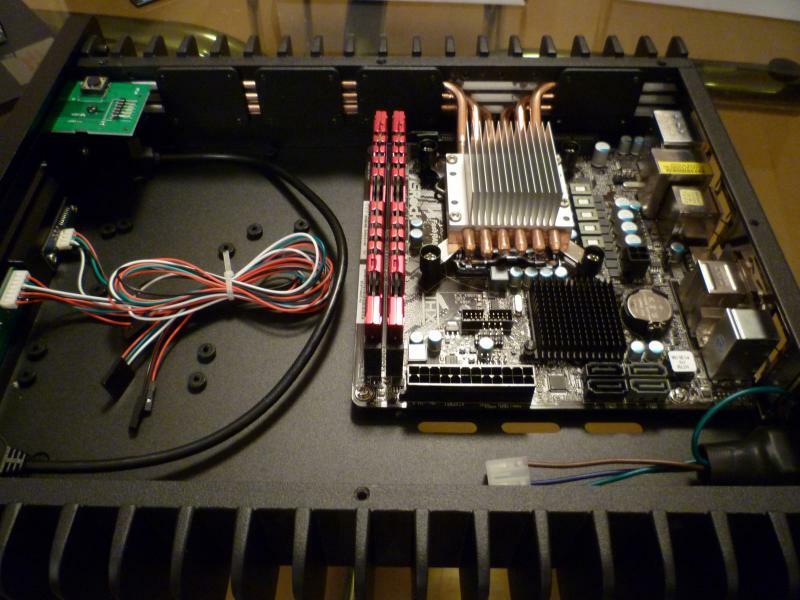 There is not enough clearance for standard SATA III cables with locking clips. 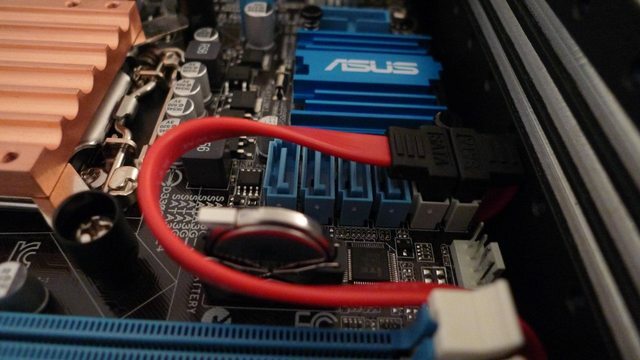 After a bit of searching I learned that there is no difference between SATA cables so I was able to use angled SATA I cables which have a much lower profile that SATA III cables. Even so, I had to trim out a section of the sleeve on the right hand cable so that I could get it to fold down and pass under the motherboard. 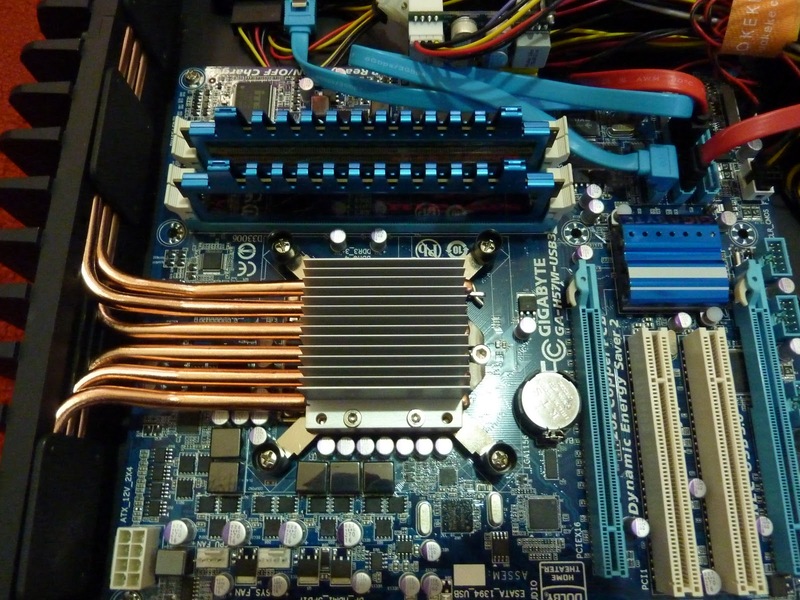 The position of the sockets would not be an issue if you were only using one drive, but it would be impossible to install three or more SATA devices with this motherboard. Here’s a shot with the heatpipes in place. That short one really bugs me! Getting the pipes into the slots in the case is ridiculously difficult. It is good for the cooling that the tolerance on the fit is so tight, but the amount of force needed to push the pipes into place is unbelievable. 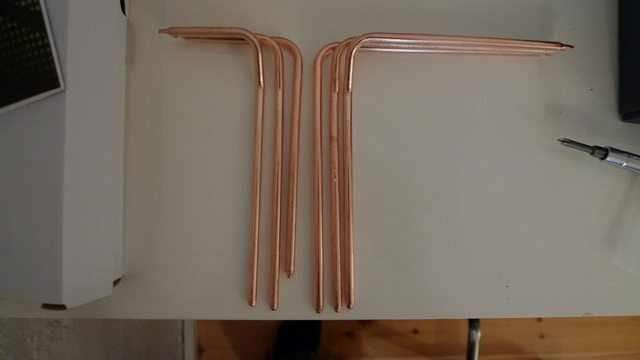 Even using the tip of starting at one end, I found I needed to use a pair of mole-grips and one of the fixing plates to spread the load to squeeze the pipes into the slots. You need to be absolutely sure everything else is in place before taking this step as doing it twice would be hell. And here’s the completed build. The USB 3.0 cable from the front of the case is another tricky one. It must be attached before fitting the HDD. The cable clearance with the top of the case on the motherboard side is also quite tight. I used an adhesive cable-clip on the side of the case to keep the cable out of the way. 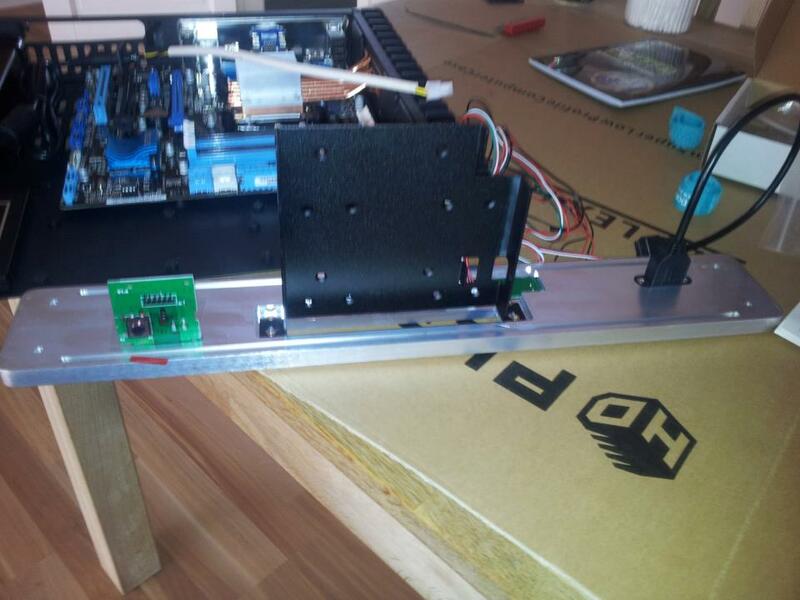 The build worked first time and set-up after that point was easy and straightforward. 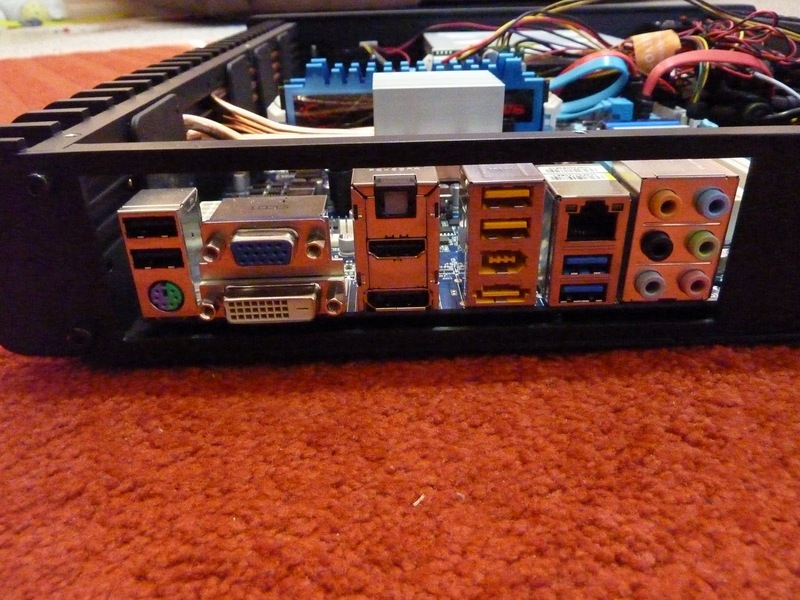 Here’s a pic of the HTPC in my rack. It’s the box on the left shelf. Clearance inside the AV unit is fairly tight, around 4 cm each side. 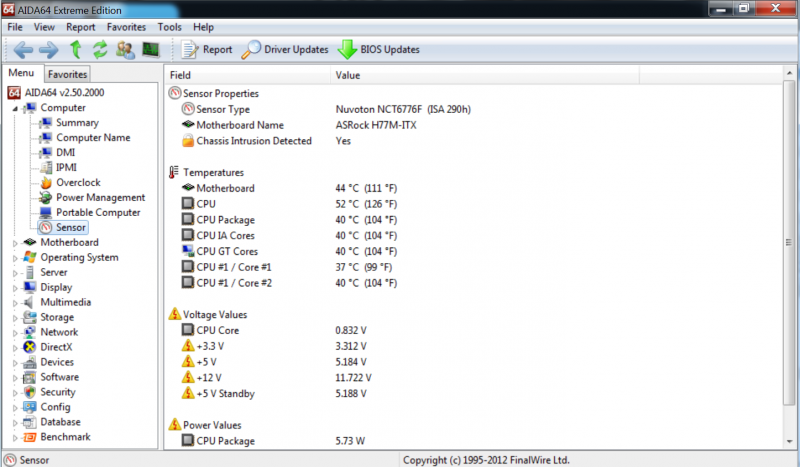 The PC settles at 45C in normal use with the motherboard slightly hotter. I ran Prime95 a few times and temperatures stabilised around 55C, which seems reasonable considering the PC will never be working under that kind of load in normal use. As you would expect it is completely silent. Even the HDD is as good as inaudible. I’m running XBMC which is just brilliant. Overall then, the build was fun but challenging and occasionally frustrating. 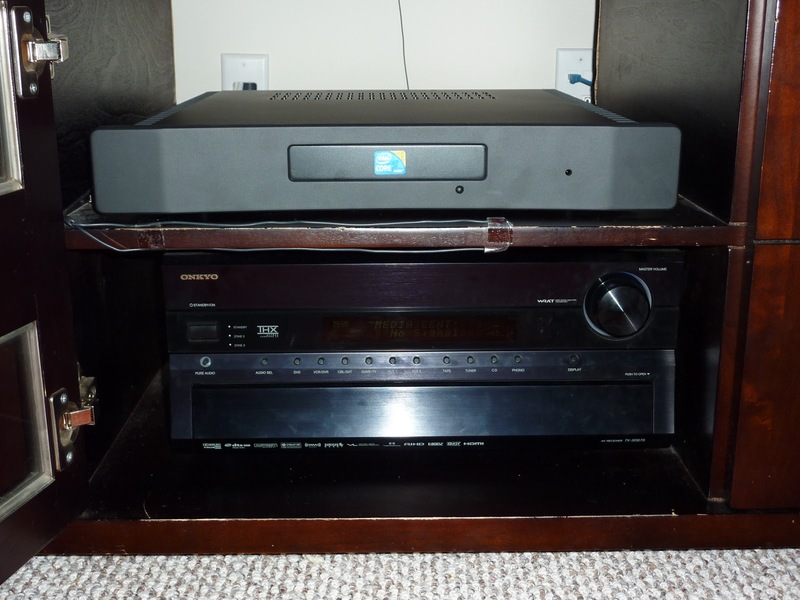 The end result is awesome though, a totally silent, and beautifully designed HTPC that fits right in with my other AV equipment. 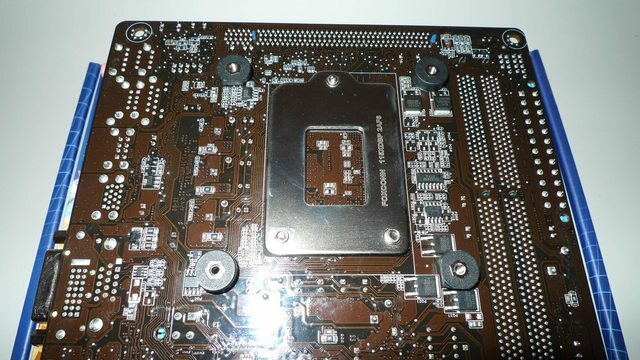 Haswell LGA1150 motherboards begins to show up at Cebit 2013. Compatible for HDPLEX H10.S and H5.S. 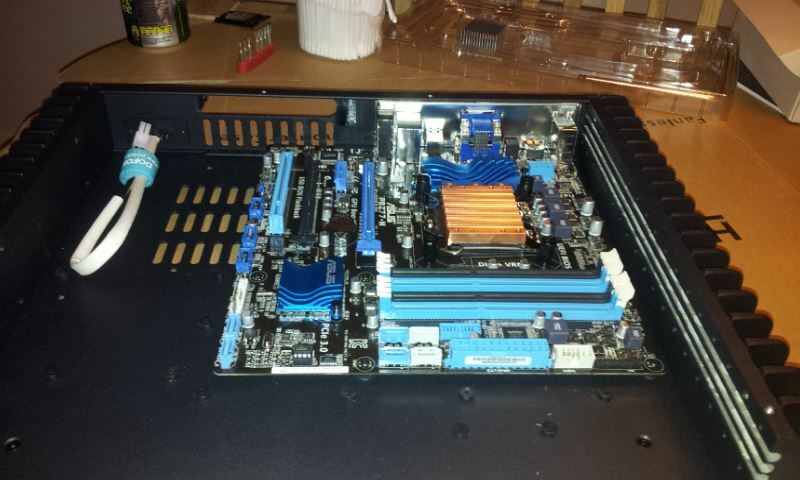 A lot more motherboards will be added to the compatible list when Haswell are formerly released on June 3rd. 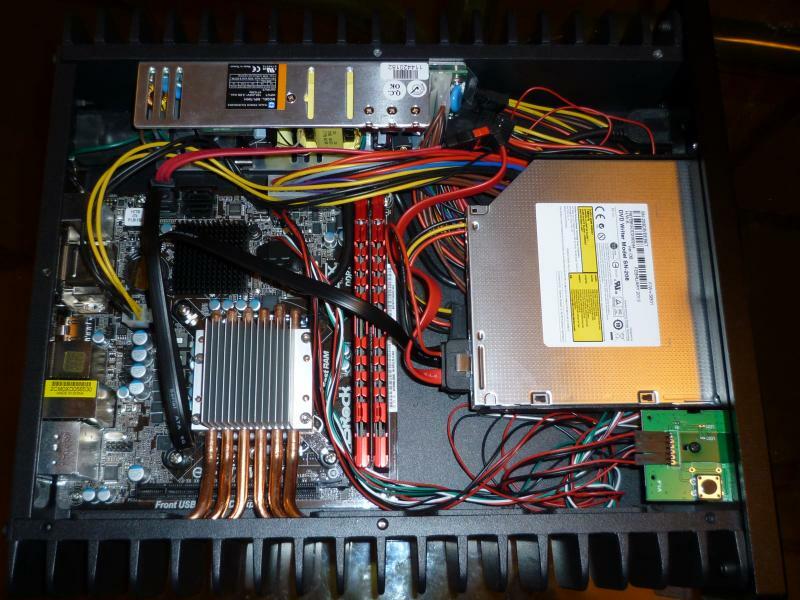 150W Fanless PC Power supply with 150W adapter installed inside the HDPLEX H5.TODD chassis. 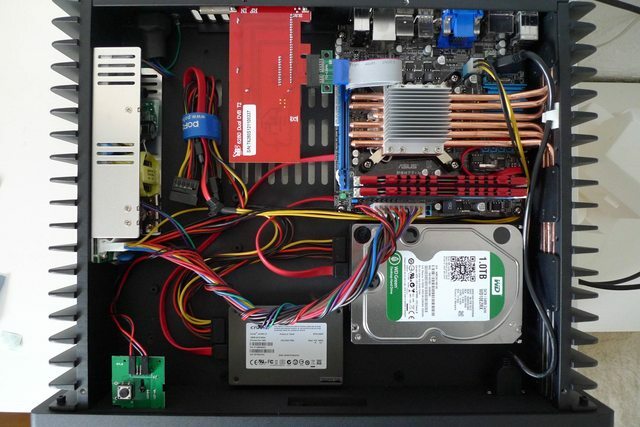 Its been almost 2 years since my last htpc build, and I’ve got upgradeditis (a.k.a strong itch to upgrade a perfectly good htpc). 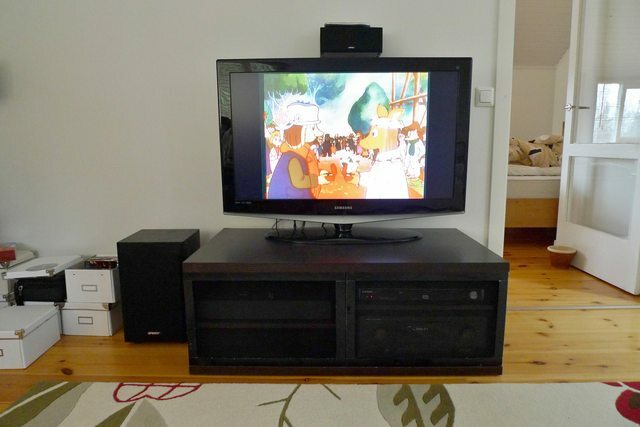 My wife and 4 year old are very much used to the media center and I’ve not paid a cable/ satellite bill in almost 2 years (very happy, saved thousands!!!). 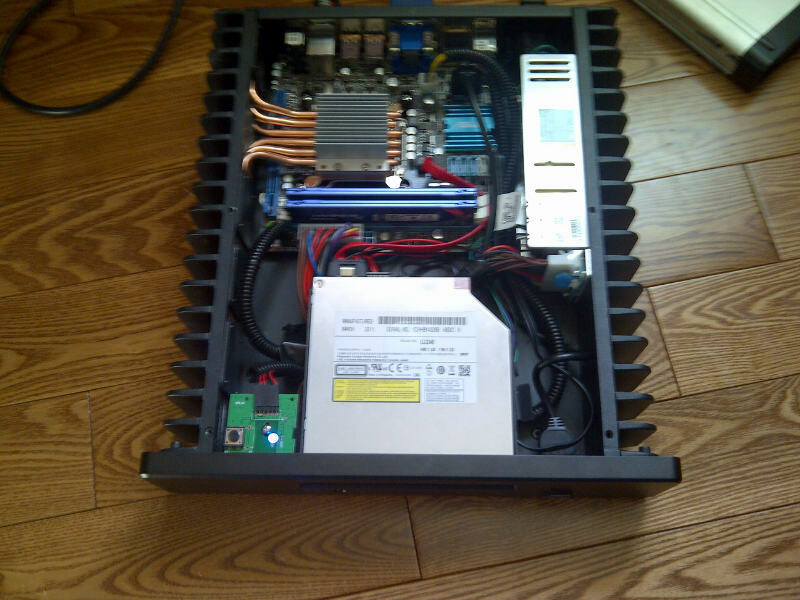 I reused the old hdhomerun, blu-ray drive and pulled a 2TB drive from my home server for this build. 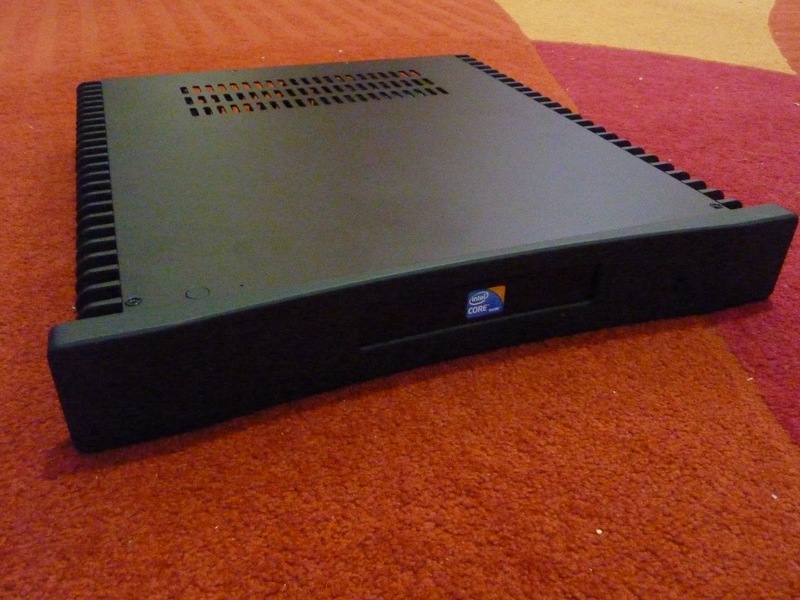 Finding a good quality fanless htpc case, that works, and looks good is tough. 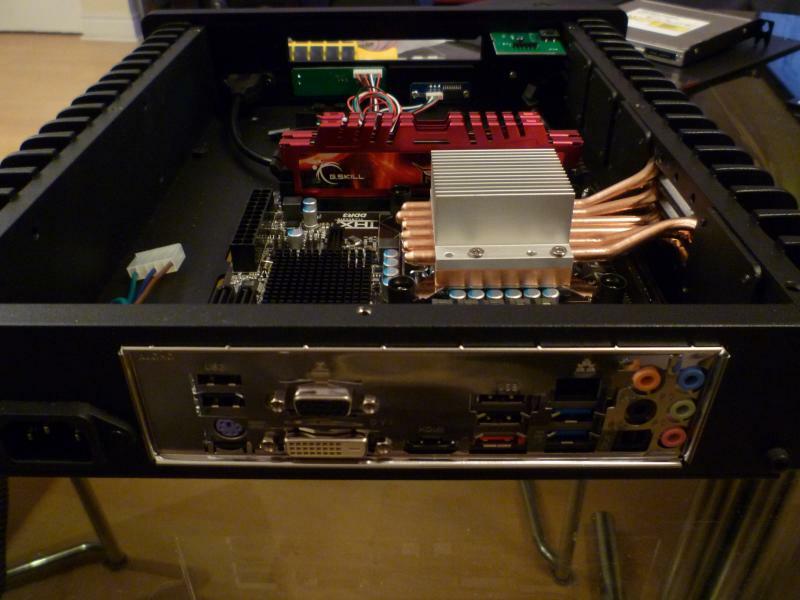 I found a case vendor that specializes in fanless htpc cases, http://hdplex.com. For some reason they never seem to have any in stock, but after repeated requests, Larry at HDPLEX, finally sent me one, and has been very helpful so far. I like this case’s extremely simple and beautiful design. Its slim, the power switch is on top and there are no distracting lights on the front panel. 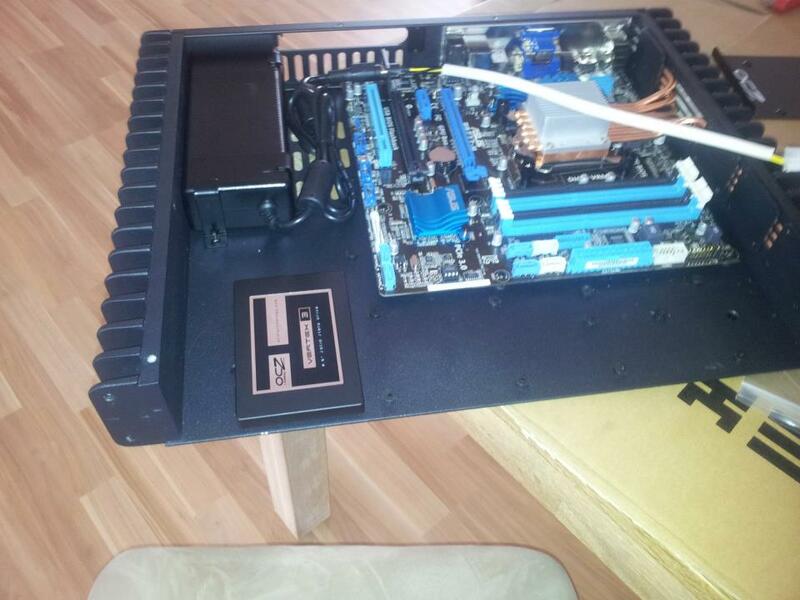 The case was very well packaged and I bought a 150W PicoPSU power supply and an internal IR receiver along with it. 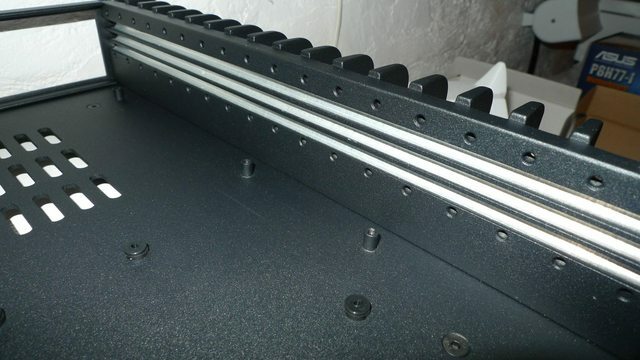 The installation instructions were very clear and precise, and printed on color glossy paper. It took me about 3 hours to finish the hardware install and get it up & running with windows 7. 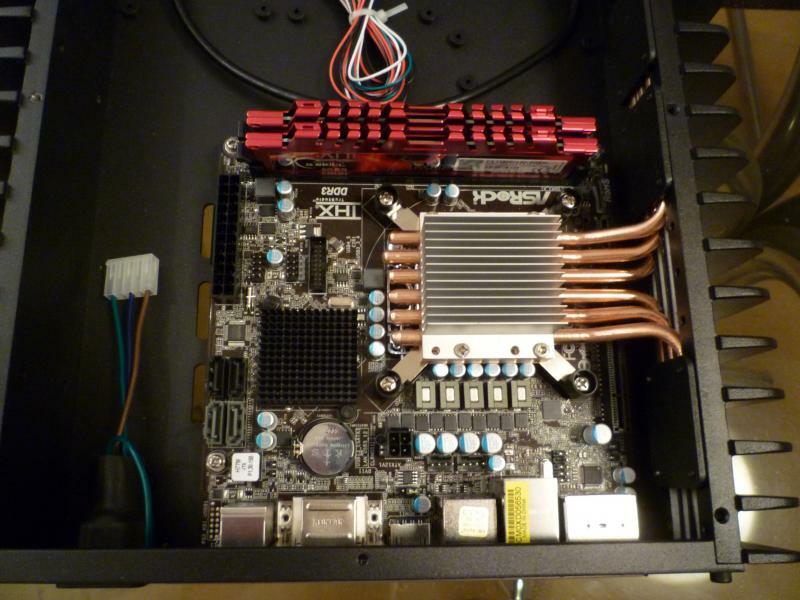 The motherboard and heat pipes were extremely easy to install. 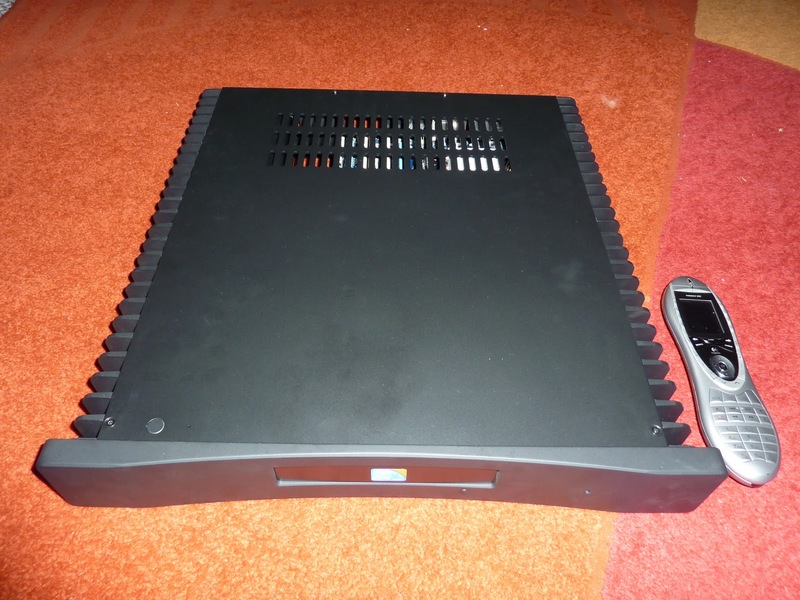 A PicoPSU power supply is required since a standard ATX(or other format) power supply won’t fit in this case.The power adapter sits inside the case since there is no pci-e video card in this system. I had trouble installing the hard drives, since the screws come in from below the case(& I placed the drive the wrong way), but after messing with it, I finally figured it out.